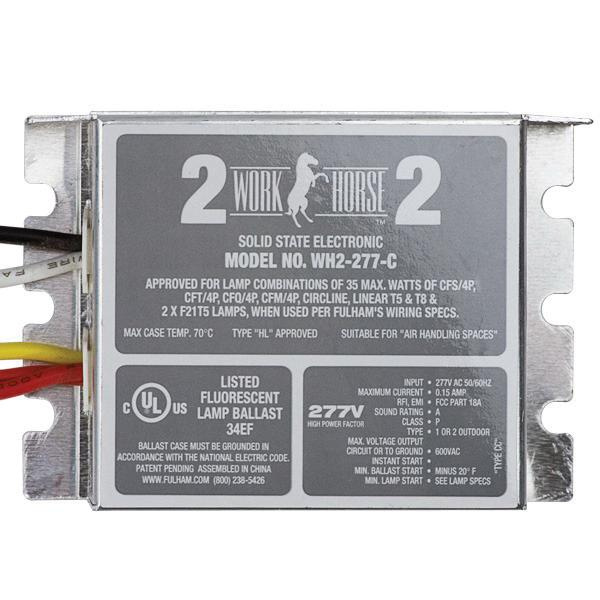 Fulham WorkHorse Series electronic fluorescent ballast is suitable for use with one/two F14T5/F21T5/F28T5/F14T5 lamps. It has voltage rating of 277-Volts and current rating of 0.08/0.1/0.12/0.11-Amp. An instant start ballast offers greater than 0.9 power factor. It features type 1 or 2 outdoor enclosure. Ballast operates at the frequency rating of 50/60-Hz. It provides Class P protection. Ballast measures 3.3-Inch x 2.3-Inch x 1-Inch. This energy saving ballast offers over current fuse protection. It withstands temperature rating of 70 deg C. Ballast is UL listed and meets FCC standards.